Rhonda Hodge says she sees Jesus in MRI scans of her spine. "You could actually see the hands. They look like they're nailed on the cross. You can see the body. It's in a straight line and then you see his feet, they look like they're together, and the knees are bent." When asked if the image of Jesus has changed her life, she replied: "I can't be swayed by a picture. My neck does feel better. I don't know if that was Jesus or physical therapy." 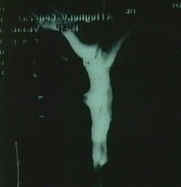 If a follow-up scan shows the same thing, it may very well be the much-anticipated Second Scanning of Christ. Diana Newton of Westminster, Texas is suing the J.C. Penney Co. after an experience with a legless mannequin left her with a cracked molar, shoulder pain, and a bleeding scalp. Newton said the incident happened nearly a year ago in the women's department, as she was shopping for a blouse. The only one in her size was on the mannequin. 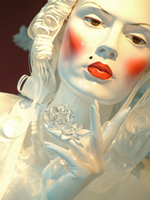 As a salesclerk was removing the garment, the dummy's arm flew off and struck Newton's head, according to her lawsuit. Looks like somebody stepped into the Twilight Zone. The mannequin episode was always one of my favorites. An Israeli woman's life was saved by her breast implants when she was caught in Hezbollah rocket fire. This is reminiscent of a news story a while back about a woman whose breast implants saved her life in a car accident. The implant had to be replaced. So along with all the other casualties in the Lebanon war, we can add one breast implant to the list of losses. There's some sort of ocean rebellion happening. First we had a blue marlin that speared a fisherman in the chest. Then a whale rammed into a sailboat and capsized it. Now a 4-foot-long sturgeon has jumped out of the water and hit a man, knocking him unconscious. Blake Nicholas Fessenden, 23, was heading north on the Suwannee River Sunday just north of the Hart Springs Sand Bar when he was hit and fell off the craft, according to a statement from the Florida Fish and Wildlife Conservation Commission. Next we'll hear that a goldfish jumped out of its bowl and slapped someone in the face! A man taking part in an international fishing tournament in Bermuda ended up being caught himself when an 800 pound blue marlin leapt across the boat and speared him in the chest. The two then fell into the water and battled it out, with the man somehow managing to free himself from the marlin's spear. Seriously wounded, his fishing companions helped him back onto the boat and did their best to stop the bleeding. Despite the fact that it took 40 minutes for the boat to reach land, he is now recovering in stable condition after emergency surgery. 'It was airborne going across the full width of the boat and Ian just happened to be in the way. All in one motion, the fish flew across the cockpit, impaled him with its bill and took him out of the boat ... 'He landed in the water about 15ft away and the marlin was on top of him." A Serbian man had surgery to remove some unusual objects from his stomach, including eight nails, a knife, a pen, a screw, a spoon, and a clothes-peg. There were also several other smaller objects in his stomach. Doctors were amazed that he had swallowed so many items without causing damage to his insides. A relative of the man apparently reported him. I have so many questions about this. How does a knife wind through your digestive system without causing major damage? What happens when he goes to the bathroom? Did he make clanking sounds when he walked? Was his wife's cooking really so bad that he'd rather eat the silverware? The identity of the patient has not been revealed. The doctors said he had suffered no major damage to his internal organs, and was successfully recovering. A woman in Council Bluffs, Iowa got stuck to a toilet seat in a shopping mall and had to be removed by paramedics. They used nail polish remover to remove her and she ended up with burns. Apparently some pranksters put cement on the toilet seat. Ouch! I guess she didn't put anything down on the toilet before sitting on it. The woman, who wasn't identified, told KETV in Omaha, Neb., that the burns are painful and that the incident was one of the most embarrassing moments in her life.